Renovating rural properties can be tricky enough without the added complications of being off-grid without access to mains gas and having to source and manage your own heating fuel supply. With the daily rigors of renovating a rural home, finding an efficient and reliable solution to heat your home without compromising on aesthetics can be a task in itself. 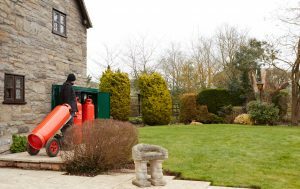 LPG is fast becoming the go-to choice for rural renovators, offering a number of options that suit the specific requirements of properties in the countryside. When space is at a premium though, traditional under ground or above ground fuel tanks aren’t always a viable solution. That’s where ingenious products like the new Calor Compact come in. Housing up to four gas bottles and offering the same conveniences as mains gas, the Calor Compact has been designed with more bijou properties in mind, saving valuable space while discreetly blending into its surroundings. So why opt for a more compact storage system? With a streamlined design the Calor Compact is a great option for homes that want the benefits of LPG but are short on outside space or have restricted access for a larger tank. The Calor compact can be placed neatly against the outside of your property letting you make the most of your outside space while providing gas to fuel your home. Many people renovating rural property use oil for home heating, as it often seen as the default off-grid fuel option. However oil tanks can pose the risk of fuel theft, as they are easy for thieves to identify and siphon oil from.In comparison there is extremely minimal chance of fuel theft of LPG from tanks or the Compact, as thanks to its secure, protective housing, the Calor Compact not only keeps your fuel securely locked away, but also protects the cylinders from the elements. Another great benefit is the minimal downtime and disruption from installation. The Calor Compact can be fitted in just a few hours, making for a fast, fuss-free installation, ensuring that you can be up and running in no time at all. Monitoring your fuel levels when you’re in an off-grid property can be a laborious task, but thanks to Calor’s clever top-up technology you can rest assured that you should never run out of gas. The technology on the Compact monitors fuel levels and when the bottles are running low, it will alert Calor and they will come and exchange them for new ones so there is no disruption to your gas supply. So for more information on the Calor Compact or to learn why Calor LPG is the clever choice for rural heating, call Calor on 0800 121 7827 or visit www.calor.co.uk.